If you think that the 401k market is your niche, think again. 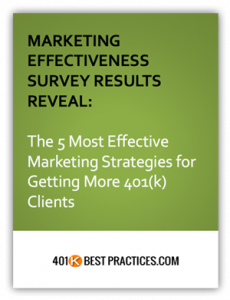 and again in step 2 in this article written for the Client Driven Practice Blog, How to Carve Out a Niche in the 401k Market. 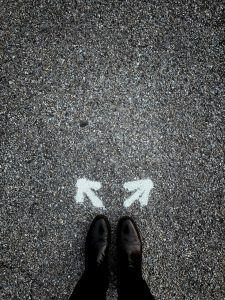 The feedback I hear quite often is that by choosing to specialize in the 401k market, many feel you’ve already narrowed your market and while that’s true, you shouldn’t stop there. 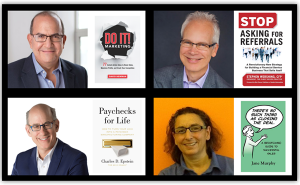 Since I’m often asked how to claim a niche in an already narrowed segment of the financial industry, let me share with you some great examples including a few I heard at the fi360 Annual Conference in a session by Ann Schleck & Company. Such as manufacturing, professional services groups, veterinary offices, tech companies, etc. Such as profit sharing plans, self-directed plans, complex plans, defined benefit plans, MEPs, Safe Harbor plans, etc. Such as socially conscious organizations, rapidly growing companies, start-up companies, forward-thinking organizations, etc. Such as companies with multilingual employees, unions, non-unions, companies whose employees work in a virtual environment or are spread out across the U.S., women-owned businesses or veteran-owned businesses, etc. Such as your unique fiduciary oversight process, or you’re the employee education specialist that helps employees create a paycheck for life, or you offer the $500 start-up plan package, or the 401k Admin Kit to help HR folks avoid operational compliance shortfalls, etc. …by choosing to focus on a specific niche in the market, it doesn’t necessarily exclude you from being considered by prospects outside of your defined niche, but it does give you a distinct advantage in your chosen market segment. Question: How have you found success in working within a defined segment of the 401k market? Shoot me a tweet to @sharonpiv and let me know!